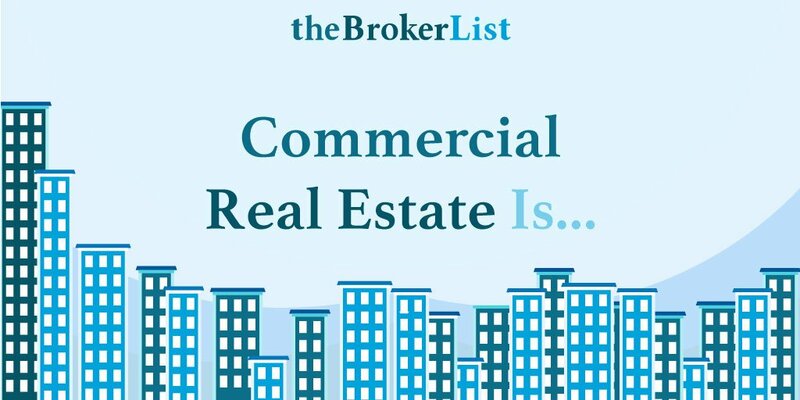 If you want to feel that jubilation of success every time you close a deal or get a lease signed or obtain a new client, you absolutely positively need to get in commercial real estate. It is a wonderful industry that can give you independence or structure, whichever you prefer. Big business or mom and pop. But no matter which path you decide, it is still the same business through and through. So when you get a letter from a client praising you for a major accomplishment, you just have to share it. That is what Natalie Wainwright and Dan Palmeri (Vegas CRE Team) do from Cushman & Wakefield Commerce (Las Vegas)! Natalie and Dan shout it from the rooftops for all of the world to see. Way to go Natalie and Dan and keep up the good work. If you really want to laugh out loud (LOL) then you have to follow @CREUnfiltered because you will really heehaw on some of these tweets. I first noticed it when the super secret, funny person behind it sent out the below tweet. I just got such a tickle out of it and it brought my attention to the bio of this Twitter site. You have to follow him or her. The real identity of “CREUnfiltered” is unknown. Bio: The fun side of Commercial Real Estate. Yes, we are using social media, but we are also trying to stand out from the crowd and make sure we do not leave a stone unturned on behalf of our clients. Example, Bobbie is a wonderful social media #CRE professional, but she combines “Old School” with “New School”. 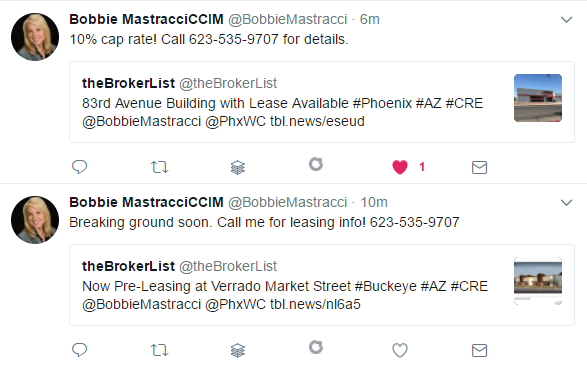 When Bobbie sees her properties come up on social media she is adding her phone number right there for people to easily notice and give her a call immediately. That is delivering customer service. It is such a pain to try to remember when you saw something and then follow up. Bobbie gets that and she takes the time out to add her phone number so people can waste no time and give her a buzz. Keep up the good work Bobbie and you sure are an outstanding CCIM too, setting a great example for all. On the topic of Old School with New School we had to give a big shout out to Dealpoint Merrill’s Danielle Watson for her use of an old school tool called a “newsletter”. Doing newsletters was standard industry practice for years and with the adoption of blogs and other online social media, the old newsletter medium has lost favor. First of all newsletters are a heck of a lot of work and you have to really have to pull many skills together to do it right. 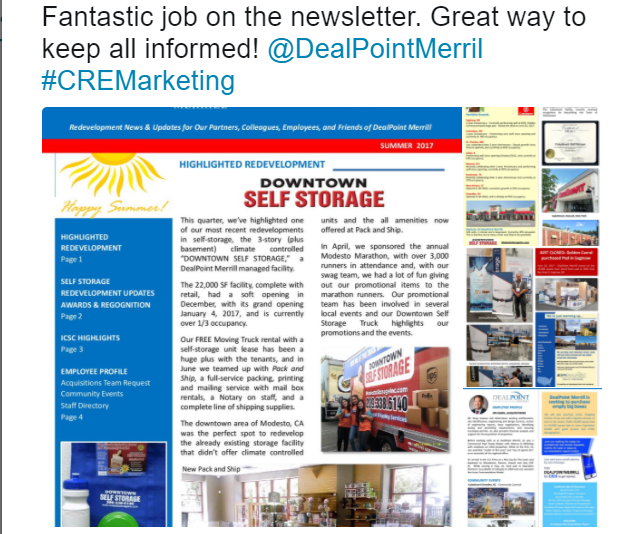 Well Danielle outdid herself when she created the DealPoint Merrill Summer 2017 newsletter this year. It was excellent. It was on point and full of great information for the DealPoint Merrill clients, employees and general audience. It was great to see someone use this marketing technique with a very modern spin. Danielle did not have to print it, but she distributed it electronically to clients and friends of DealPoint Merrill. Good job Danielle and we are always impressed by your talent!